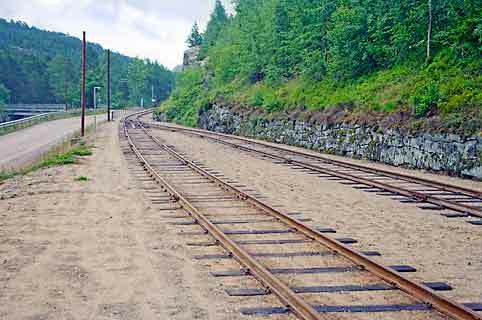 The Setesdals Railway (Setesdalsbanen) is an 8 km long preserved railway, and is important as the last remnant of 3 ft 6 in gauge in Norway. 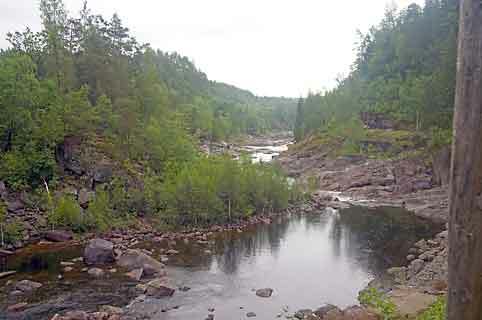 It runs along the very scenic valley of the Otra River, and includes two bridges, a 123 metre long tunnel, and a 150 metre long snow shelter. 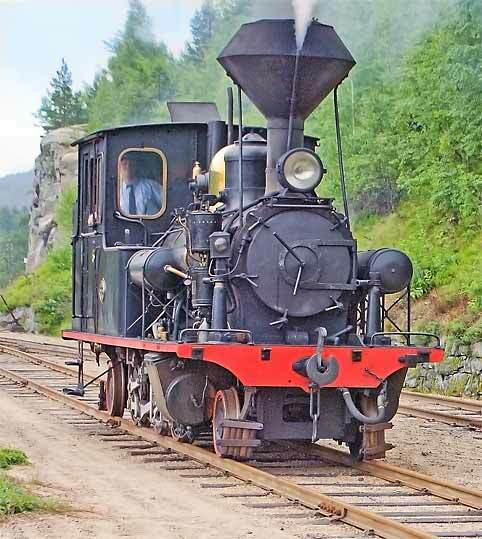 During the nineteenth century 3 ft 6 in gauge was considered to be the main-line gauge in Norway, a total of 1320 km being built to that gauge. Standard gauge was basically confined to railways connecting with Sweden. 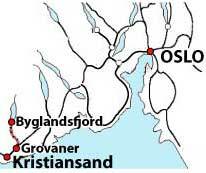 Today the Setesdals Railway runs from Grovane (20 km north of Kristiansand) to Røyknes. 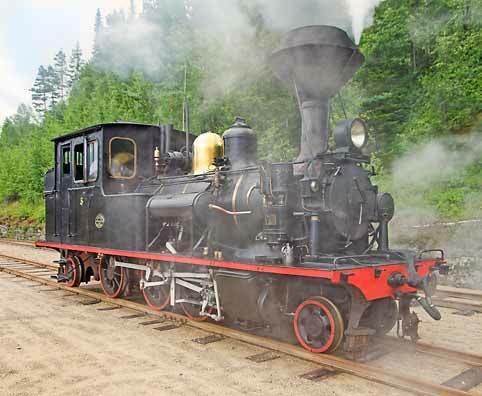 As built it extended from Kristiansand to Byglandsfjord, with a total length of 78 km. 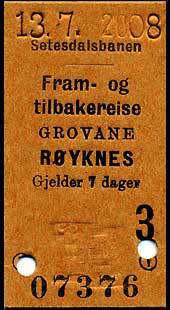 In 1938 the section from Kristiansand to Grovane was converted to standard gauge, as it became part of the main line to Drammen and Oslo. 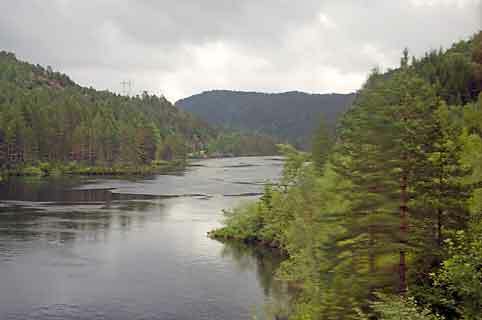 The remaining 58 km to Byglandsfjord was left as 3 ft 6 in gauge. By 1949 every other 3 ft 6 in gauge railway in Norway had been converted to standard gauge, but the traffic on the Setesdals line did not warrant conversion. The main traffic was timber but there were sufficient towns of reasonable size on the railway to justify running petrol and later diesel rail motors. The timber traffic declined and the railway was closed in September 1962, the local community giving the railway a very moving send off, complete with speeches, choir, brass band, poetry reading and a wreath on the leading locomotive. As a preserved railway, operations commenced over a 5 km section from Grovane in June 1964. Subsequently a further 3 km was restored. The Setesdalsdan is very heritage conscious, and issues and cancels Edmonson tickets in the traditional manner. 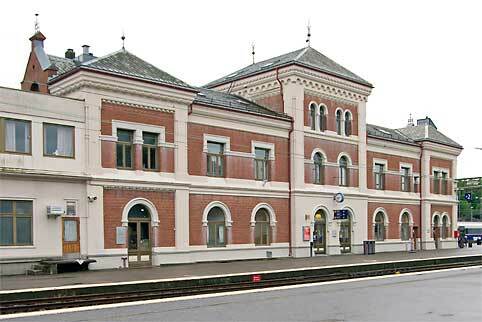 Kristiansand station. Kristiansand is Norway's fifth largest city, with a population of 65,000. 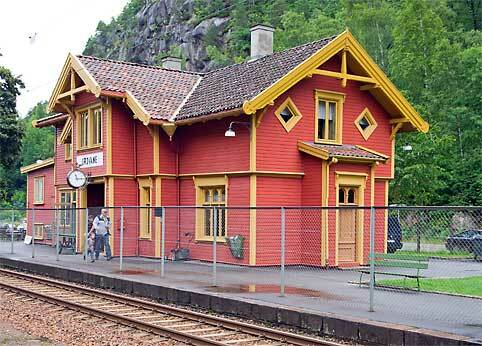 This impressive station building was built in 1896 to serve the 78 km long Setesdals railway to Byglandsfjord. To me it seems incredible that such a large building would have been provided for a minor 3 ft 6 in gauge railway whose main traffic was timber. However it was at that time an isolated railway, so the building would have contained administrative offices, and probably accommodation for the station master. In any case the first 20 km of the railway was designed with easy curves in the knowledge that that section would eventually become part of the mainline to Oslo. Presumably those who designed the station also had in mind that it would eventually be an important main line station, but it was to be 42 years before the link was made..
Grovane station, now the headquarters of the Setesdals Railway. 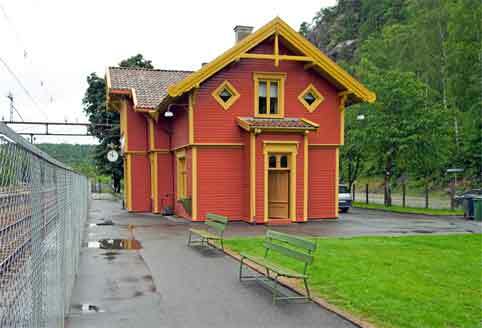 The building dates from the line's opening in 1896, and is typical of architecture of Norwegian stations of that era. Such buildings seem larger and more elaborate than you would expect in small towns, but they included accommodation for the station master's family, and were designed to suit Norway's cold winters. Another view of Grovane station. Standard gauge trains no longer stop here, and unfortunately a chain-wire fence has been erected on the platform to prevent passengers from straying on to the standard gauge tracks. At departure time of Setesdalsban trains, passengers are let through a gate in the chain wire fence, and allowed to walk over the two standard gauge tracks. To stop standard gauge trains from entering the section at this time, a shorting wire is placed across the standard gauge tracks to indicate that it is occupied.. 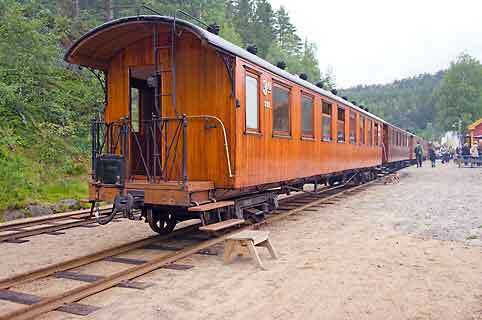 The Setesdalsban was unusual amongst Norwegian 3 ft 6 in gauge railways in having curves as sharp as 100 metres (5 chains or 330 feet) radius. As a result specially designed 2-6-2T and 2-4-2T locomotives were built for the line. The first were built by Dübs & Co. of Scotland in 1894, with later examples being built by Thunes of Oslo. 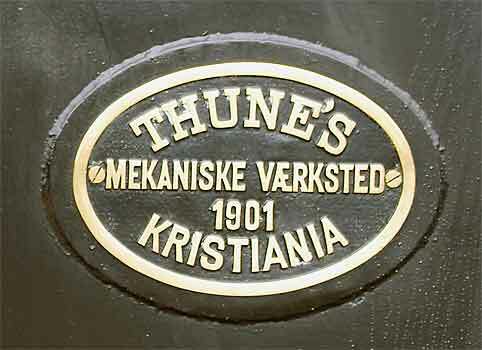 The Setesdalsban has examples of both the Dübs and Thunes 2-6-2Ts, and a Thunes 2-4-2T. Here we see No.5, Thunes 2-6-2T of 1901. Like everything associated with this operation, the locomotive is very well turned out. A little closer. The railway is laid with 20.5 kg/m (41 lbs/yard) rails, as a result the maximum axle load of the locomotives is only 6 tons. In the nineteenth century the same weight of rails was used by the Queensland Railways for many of its long outback lines. 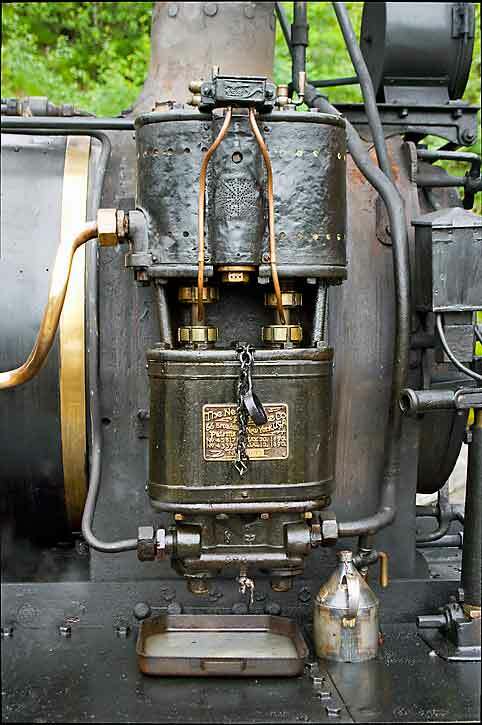 For comparison, the axle loading of the Victorian Railway 2 ft 6 in gauge NA class 2-6-2T locos is 9-1/2 tons. 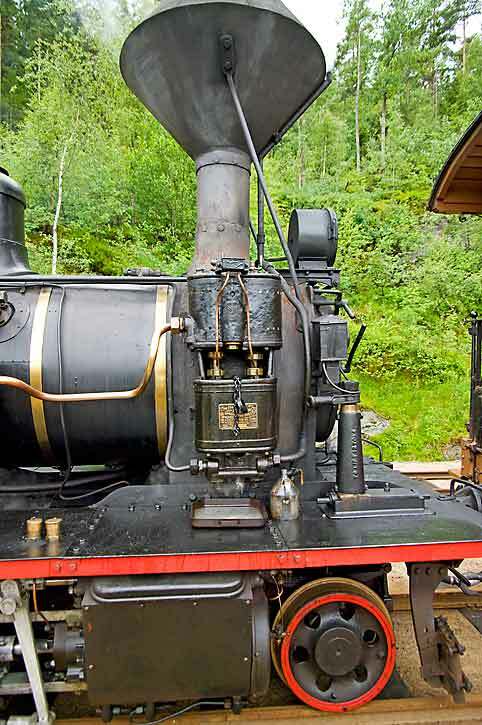 Despite being 3 ft 6 in gauge the Norwegian 2-6-2T weighs only 18-3/4 tons empty, compared to 28 tons for a Victorian NA. However, the steepest grade on the Setesdals railway was 1 in 50, compared to the 1 in 30 that the NAs had to face. The Setesdals railway has a very interesting collection of rolling stock. 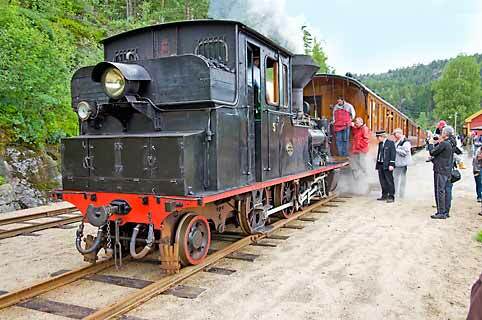 One of the passenger cars has come from the privately owned Thamshavn railway, which was metre gauge and worked in conjunction with the steamship Orkla. 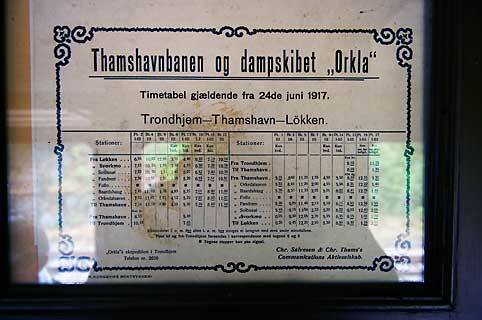 The vehicle has been converted to 3 ft 6 in gauge, and still displays this timetable inside, which is dated 1917. 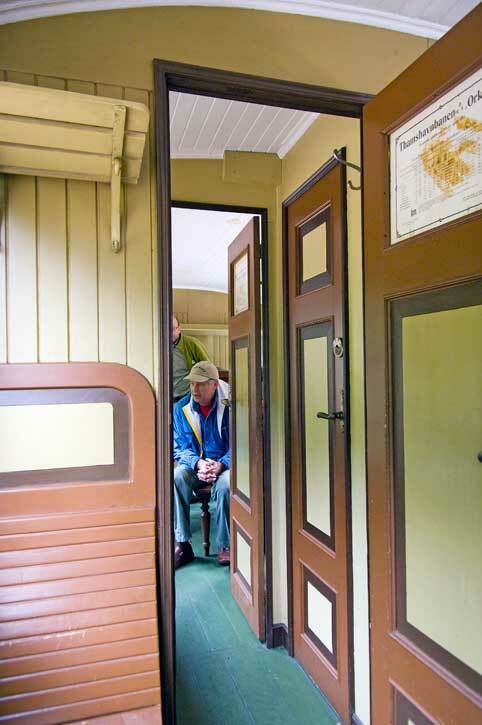 Interior view of the ex-Thamshavn railway passenger car. The railway runs down a very scenic valley. On one side of the train, and very close to it is the steep and very rocky side of the valley, on the other is the Otra River. This picture was taken from the train. And so was this. The route of the railway can be seen on the right-hand side of the picture. The train at the current terminus, Røyknes. View of the track at Røyknes, looking back towards Grovane. 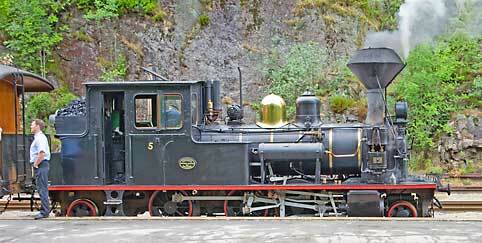 The loco, No.5 at Røyknes. The loco has run round the train and is ready to return to Grovane. The builder's plate. It means Thune's Mechanical Workshop. Kristiania is the old name for Oslo. Close up of the airbrake pump. 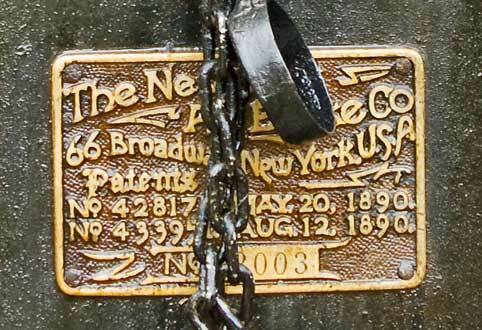 The builder's plate on the air-brake pump! 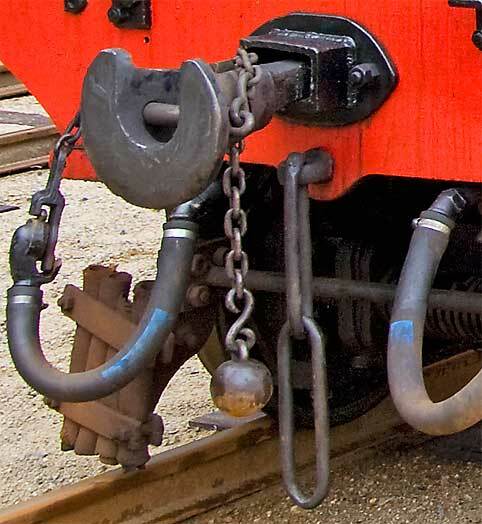 Close-up of the rear buffer beam of the loco, showing the chopper coupling, and the ball-shaped weight on the end of a chain - which is part of the coupling system. Close up of the chopper coupling. 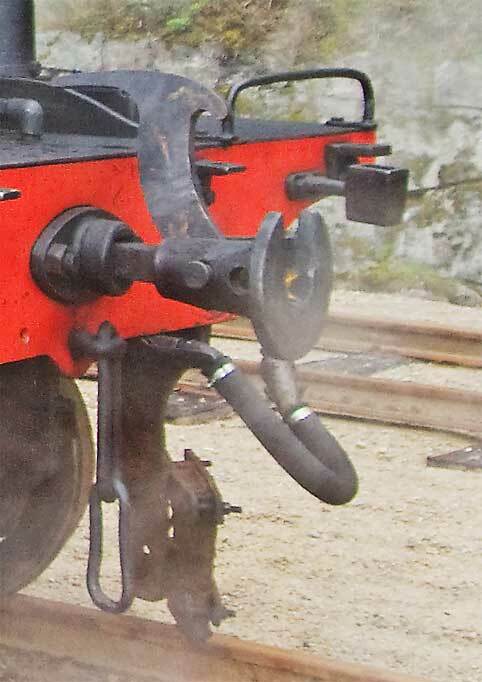 The chopper coupling at the other end of the locomotive, showing the unusually shaped hook which gave the coupling its name. Two chopper couplings coupled together. When in motion the coupling hook sometimes jumped out of the coupling, so ball-shaped weight on the end of the chain was added. The weight is thrown over the hook, as shown here, and holds the hook in place. 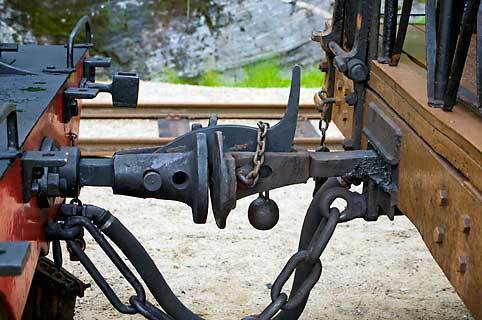 The chopper coupling was a Norwegian invention, and was taken up widely, including by the Western Australian Government Railways and the South Australian Railways for its 3 ft 6 in gauge lines. Queensland did not use the chopper coupling, at the time the first railway was being built in Queensland the chopper coupling had not been invented. 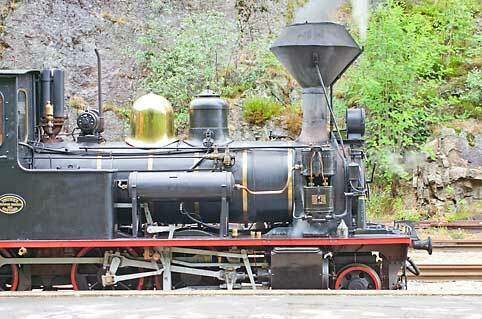 On the first two Norwegian 3 ft 6 in gauge railways - opened in 1862 and 1864 - link and pin couplings were used. 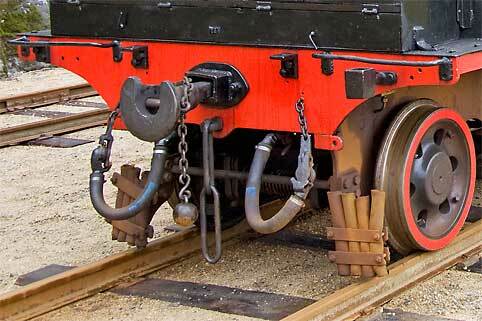 However they were not the same as American link and pin couplings. They were turned ninety degrees so that the link pivoted vertically, not horizontally. It was then a relatively small step to change that into the semi-automatic chopper coupling, which was very much safer than the American link and pin.